Club Penguin Cheats by Mimo777 Club Penguin Cheats by Mimo777: Club Penguin Volcanic Treat Shop? Q: Is this smoke we're seeing coming from a volcano? Or is it a mountain? A: At first I thought it might be the Tallest Mountain, but it can't be. After all, there are taller mountains surrounding the one that's smoking. And when you think about it, it must be a volcano! Most of the mountains on Club Penguin have snow on the top of them, but that mountain has never had any snow on it. Q: Does this have anything to do with the ninja stuff that's happening? 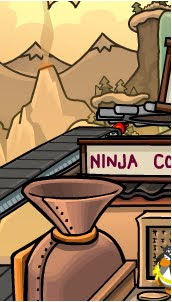 A: Well I can't give away all our secrets, but I've noticed that the ninjas in Club Penguin have been very active lately! Q: Um...Haven't you noticed that there's no TREAT shop on the map? A: I suppose there are no treat shops, but if you ever need to satisfy your sweet tooth go to the kitchen at the Pizza Parlor and turn the big red lever on the Pizzatron 3000! Wow! Could there really be a Treat Shop in the Volcano? Sounds to me like there would be chocolate lava if it blows! Sweet... literally! Do you think Club Penguin will add a Treat Shop? If so, will it really be in the Volcano? HAHA AWESOME POST! I LOVED ALL THE HILARIOUSLY CORNY SWEET SHOP JOKES! LOL THEY ROCKED! cool cant wait to see what it is! Mimo, did you saw it? Look: "In Other News: We're working on organizing the blog a bit - You might notice today that you'll only be able see the last three months of What's New posts." if it WAS a chocolate volcano wouldn't it be more brown? The lava will go to the hideout and fill the pit. That's why in the newpaper it's like that. actually im not sure now... maybe yes. I think Mimo means that the LAVA might be chocolate. LOL! but that would be really cool if it was a choclate moutain! Dude, Chrisdog93 copied u! Whats wrong with him! And you're the one who keeps telling us not to copy! He's got a lot of nerve. saleighvaughnhey mimo have u noticed that the cp homepage is aqua? seriously its aqua! i think the lava is melted carmel and the valcano itself is like white chocolate that has turned gray from all of the smoke! btw did u know if u click on the hydro-hopper on the homepage on cp its passenger jumps! Nope, they mean you wount be able to look at all the posts that are older than 3 months. I think Mimo means the lava will be chocolate, not the volcano. COOL! When will the new room be out? What if the volcano erupts and it goes all over the island and we have a big party that has to do with lava. I think it will be a new party! cleaning up Club Pengiun after the Volcano blows! I had seen somewhere that Club Pengiun was running low on money... so they might use this as an end to CP! I HOPE NOT! I love CP! i know how exciting it is to have something you love, but one of the mimo comment rules were no caps lock, we all don't want mimo deaf, right? well, if mimo all of a sudden get supper powers so he hears what hes reading, then no. organizing the blog a bit - You might notice today that you'll only be able see the last three months of What's New posts." Mimo. If we have a volcano on the island. We wont just have thunder storms. WE WILL BURN IN LAVA!!! i wonder if the volcano is anything to do with the penguin time forgot because they are all about lava and stuff like that. ya know what i mean? Club Penguin means you won't able to look at posts older than 3 months! I'm not sure when, but maybe a few weeks or so. I no what cha mean! Lol! No, i think its going to be a new room. GO TREAT SHOP!!!!! THAT WOULD BE AWESOME!!! I HAVE ALWAYS WANTED TO SEE CLUB PENGUIN PENGUINS ACTUALLY EAT!!!!!! wow thats so cool mimo! i hope its not for members only!!! im a nonmember!! ha! SO THERE WILL BE A NEW ROOM. its ok!! keep on trying to be a ninja! i know it took me like forever!!!!!! Hey Mimo and the rest of the CPG, I wanted to tell you, only I kept forgetting, But, Um, If you didn't notice, The escalator thing with the moving table shows the "fiery items" on it, they roll by! OMG! It Looks Sooo Cool! Hey! Come on, CP. I liked the whole blog! ;-( Boo-hoo. volcano might be on the blank camera in the secret agent HQ! Ummmmm I think Mimo means more like a chocolate foutain lol. Like chocolate lava. Lol.